Depending on alloying elements and heat treatment, aluminum grades can exhibit a wide variety of properties, from good appearance, ease of fabrication, good corrosion resistance, to high strength-to-weight ratio, good weldability and high fracture toughness. Selection of the proper aluminum grade ultimately depends on the application needed and working conditions. These grades of aluminum (1050, 1060, 1100, 1145, 1200, 1230, 1350 etc.) are characterized by excellent corrosion resistance, high thermal and electrical conductivities, low mechanical properties, and excellent workability. Moderate increases in strength may be obtained by strain hardening. Iron and silicon are the major impurities. These aluminum alloys (2011, 2014, 2017, 2018, 2124, 2219, 2319, 201.0; 203.0; 206.0; 224.0; 242.0 etc.) require solution heat treatment to obtain optimum properties; in the solution heat-treated condition, mechanical properties are similar to, and sometimes exceed, those of low-carbon steel. In some instances, precipitation heat treatment (aging) is employed to further increase mechanical properties. This treatment increases yield strength, with attendant loss in elongation; its effect on tensile strength is not as great. These aluminum alloys (3003, 3004, 3105, 383.0; 385.0; A360; 390.0) generally are non-heat treatable but have about 20% more strength than 1xxx series aluminum alloys. Because only a limited percentage of manganese (up to about 1.5%) can be effectively added to aluminum, manganese is used as a major element in only a few alloys. This series is not currently used. The Total Materia database includes more than 30,000 aluminum grades from all over the world. Chemical compositions, mechanical and physical properties, cross-references and more can be readily viewed. 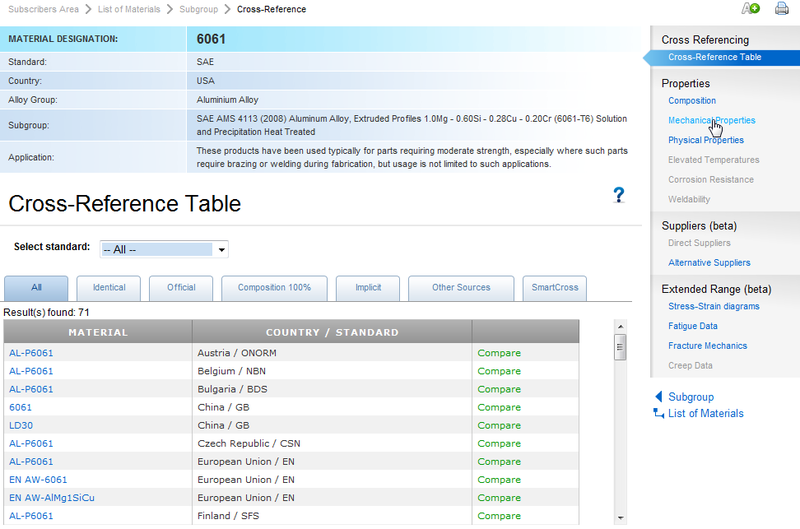 Finding an aluminum grade in the database is very easy and takes only seconds. For example, let’s look into properties of aluminum grade 6061 according to SAE. Simply use Quick Search at the Subscribers Home page and enter the designation and select SAE from the standard list. 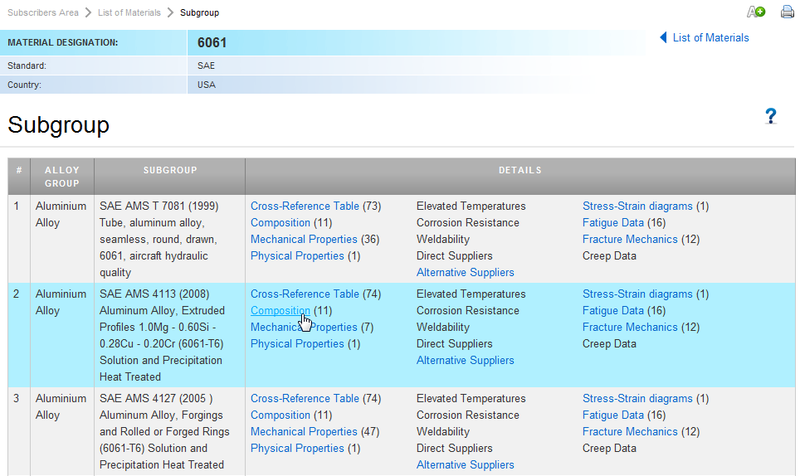 After clicking on the material, a list of subgroups appears. 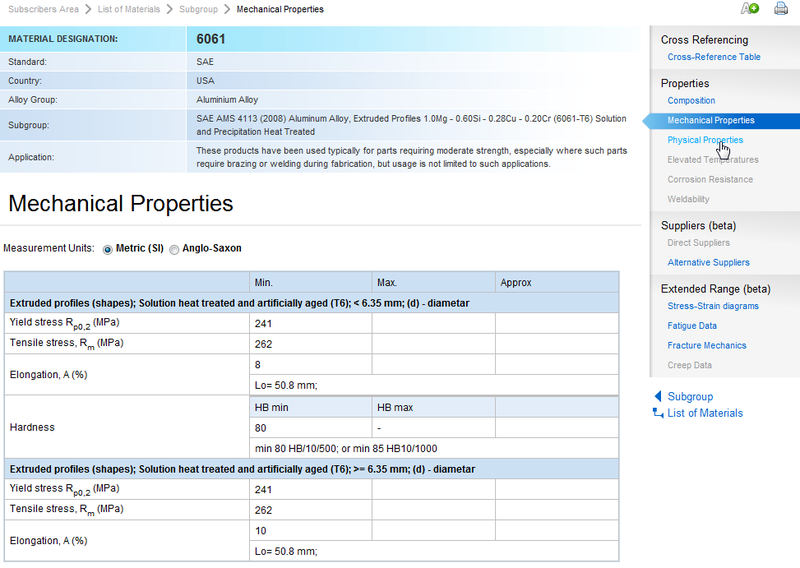 In Total Materia, the term “subgroups” refers to specifications that define properties of the aluminum grade; in this case the standard specification SAE AMS 4113 is selected. Note that properties defined according to different specifications may differ significantly. 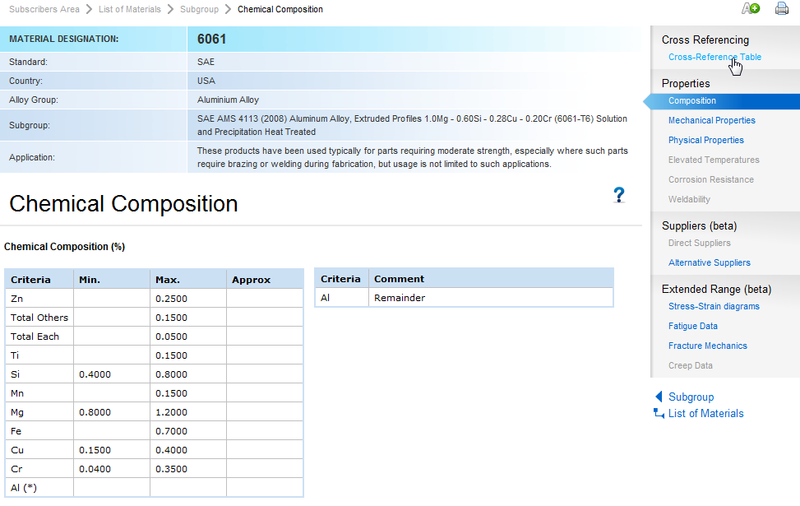 Composition, cross-references and properties of the aluminum grade SAE 6061 can then be reviewed by clicking appropriate links, see examples below.